Guitar multi-effect pedal. 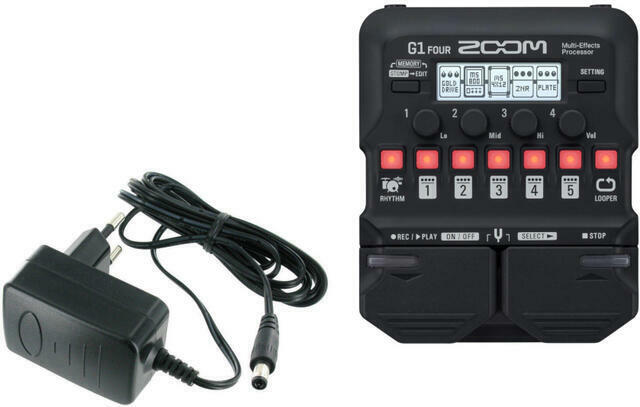 The Zoom G1 Four feature over 70 effects and amp models, looper and drum machine. Plus, access ZOOM Guitar Lab’s additional library of downloadable effects. Pedal have more than 60 traditional and boutique effects, including ring modulator, pitch-shifting delay and even sitar simulation. With 13 classic amps and cabinets like Fender, Marshall, Orange and more, the G1 series brings big stage sound wherever you go. With ZOOM Guitar Lab, explore an endless world of artist patches, effects and more. And with its ability to manage and backup all of your patches, you can experiment and create endless combinations. Play along with 68 great-sounding rhythm patterns in different time signatures, including 4/4, 3/4 and more. The built-in looper can record up to 30 seconds of playing, allowing you to create dynamic, multi-part arrangements. AC power adapter with rated input AC100-240 V and rated output DC 9 V/500 mA (negative centre), designed for use with Zoom effect pedals and rhythm machines (1010, 1202, 1204, 2020, 2100, 3000, 3030, 4040, 5000, 5050, 504, 504II, 505, 505II, 506, 506II, 507, 508, 509, 510, 606, 607, 707II, 708II, A2, A2.1u, A3, B1, B1X, B1on, B1Xon, B2, B2.1u, B3, BFX-708, G1, G1N, G1on, G1Xon, G1u, G1X, G1XN, G2, G2.1u, G2Nu, G2.1Nu, G3, G3X, G5, G5n, GFX-1, GFX-3, GFX-5, GFX-707, GM-200, H4, HL-01, MRS-4, MRS-8, MRT-3, MS-100BT, MS-50G, MS-60B, MS-70CDR, PD-01, PFX-9003, PS-02, PS-04, RFX-300, RT-123, RT-223, RT-234, RT-323, SB-246, ST-224, TM-01, UF-01). Do you own Zoom G1 Four SET or have you had a chance to try it?